PACKAGED IN THE USA! 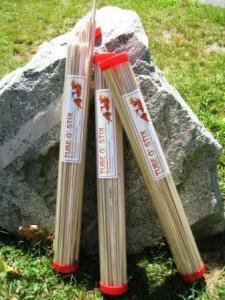 Sticks harvested and milled in Maine and Europe - none from China - no bamboo. Quality inspected and packaged here at the Marshmallow Stick Company in Maine. 120 clean-white-birch marshmallow sticks in a sanitary, colorfully labeled, clear plastic storage canister with bright red end caps. 30" length keeps kids safely away from the fire. 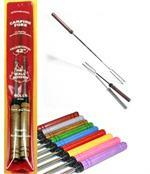 Child-friendly, semi-tapered ends that easily poke into marshmallows or hot dogs, but are not dangerously sharp and pointy. Easy to grip 1/4" diameter. Sanded smooth - no splinters! *** Help us recycle plastic tubes and get a discount of $14 per case. Select SOME IN TUBES/SOME LOOSE in the drop-down menu above. You'll get one Tube O' Stix 120 (or two Tube O' Stix 60s) and the rest "loose" - bundled in 60s. Tubes can be re-used. PURCHASE ORDERS: We accept emailed purchase orders for 1 or more cases of Tube O' Stix 120s. LARGER ORDERS: Contact us for pricing for 4 or more cases shipped to one location at the same time..
CONTINENTAL USA SHIPPING OPTIONS: UPS Ground or UPS 2nd Day Air. Ground shipping takes about a week and is FREE. Please call us in advance to confirm availability of 2nd Day Air. SHIPPING TO HAWAII, ALASKA OR CANADA: Email or call to place your order and get subsidized shipping.